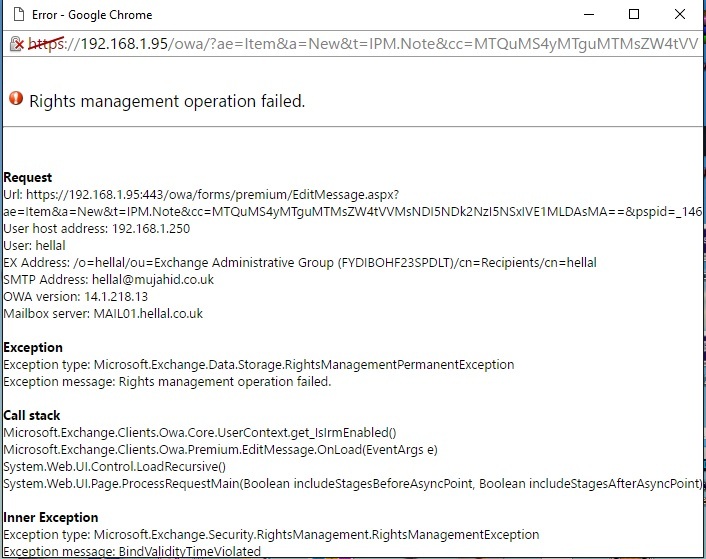 I have rebuilt ther exchange server twice but on both occassions got this error any help would be much appreciated. PS: Replace Contoso with your exchange server name! I no longer had the original server that the error was on as i had given up waiting for a solution having posted my problem on forums. Today i tried rebuilding the server following all the exact same steps that i have documented. The only thing i can think of that was probably giving me the rights management operation failed error on the previous server was probably the date was most probably incorrect as i had read this on another forum. I had already tried disabling IRMEnabled previously but that did not resolve my problem at the time. So anybody else getting this error. if disablying IRMENABLED does not resolve check to to ensure the date is correct on the server first. Not the answer you're looking for? Browse other questions tagged exchange-server-2010 or ask your own question. How to synchronize with outlook calendar in java?